When you see fortune cookies, it’s not the cookie you’re craving, it’s the fortune. I mean, there are plenty of baked desserts but how many of them can reveal your future? 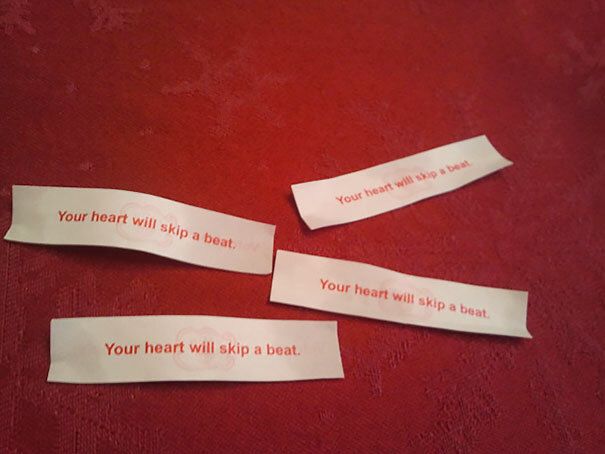 Fortune cookies are known for their cute, funny, sometimes philosophical messages about the future along with a taste of delight. Some of these funniest messages, however, are so surprising, they catch people completely off-guard. So we have gathered some of the funniest messages ever found in fortune cookies to prove that Confucius isn’t behind all of them! 1.Nothing is too simple to ignore, the cookie you can help a lot, help someone to smile a little seeing the message. 2.Sometimes the messages inside are a hit, but sometimes they miss! One of the funniest messages ever found in fortune cookies. 3.Now that’s called life cycle, send a letter to yourself and feel good about it! 4.Those are one beat too many to skip. Please consult a doctor. 5.Great advice or is it some kind of warning? 6.Maybe that’s the cookie appealing to the Forrest Gump in you!! 7.Love might be around another corner, don’t give up! 8.Light might be beyond the reach, but darkness, everywhere there is! 9.Now those cookies are the sign of a marriage going to happen soon! Kudos. 10.Now that is what we would call a straight-faced cookie, it just tells you the truth and only the truth right to your face. 11.In life, take only the positive and throw out the negative, what I really mean is the second cookie was not yours to take in the first place. 12.If you can read this, I proclaim you literate. 13.That is a message right out of cookie prison, coming out after a long sentence. 14.If nobody saw it, then there is no proof. 15.Parts and sum of parts are discussed in this mind-boggling cookie message. If the sum of parts does something wrong, however small your contribution might be the part is also wrong. 16.Hypocrite cookie message, says to do one thing and does not do it himself! Have some dignity, cookie! 17.Follow the trail, detectives and save the cookie man. 18.The message basically insulted you to your face or complimented you on your eating prowess. 19.Message with lots of intricacies and profound meaning. 20.Seriously, what do you expect! Tiny novels of your life inside a cookie. 21.The unopened one, kind of reminds someone of Schrodinger’s cat experiment, unless and until you open the lid of the box, you never know if the cat is dead or alive. And once you open it, the result is permanent and you have to live with it. Some go through whole lifetimes not opening the lid and not knowing what the result might have been. 22.Cookies identifying characters in a family. 23.Only you can keep a secret, maybe you can’t.